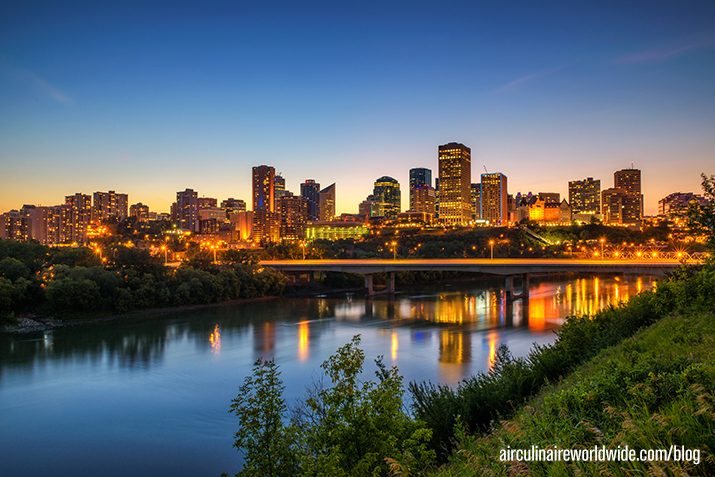 Settled on the North Saskatchewan River, Edmonton is the capital of Alberta, a Canadian province. Known as the “Gateway to the North,” Edmonton is the second largest city in Canada and the northernmost metropolitan area in North America. When working on a private aviation trip to Edmonton, you will land at either Edmonton / Villeneuve Airport (CZVL), located northeast of the city center, or Edmonton International Airport (CYEG), located south of the city center. During preparations for your trip, if crew or passengers require scheduled private transportation during your time in Edmonton, arrangements are available through Universal Private Transport. For inflight dining options on your departure from Edmonton, your needs can be fulfilled through the Air Culinaire Worldwide® Network. As always it is best to plan your inflight catering needs at least 48 hours ahead for the details of your next leg, especially during peak season. Known as “Canada’s Festival City,” Edmonton has a packed calendar of over 100 events to enjoy throughout the year. Edmonton’s festivals truly have something for everyone, from Western Canada Fashion Week, which focuses on the hottest trends of the day; to Dickens Fest, celebrating the holiday season through 19th century traditions. Music, arts, sports, dining and beyond; Edmonton’s festivals are a big draw for the city and a massive list can be found here. As if Edmonton didn’t have enough to offer visitors with their non-stop calendar, add to that an enormous list of restaurants. Cuisine options can be found from all across the globe in Edmonton, such South African, East Indian, Venezuelan, Korean, Mexican, Chinese Hot Pot, Iranian and Taiwanese. You will also find you choice of local coffee spots and patisseries, cafes, and even vegan and gluten-free establishments. An extensive list can be found here. If you are looking to stay indoors, be sure to visit the largest mall in North America, West Edmonton Mall – complete with indoor water park, an amusement park with 27 rides, an aquarium with over 100 species of sea life, and, of course, countless dining option and retail stores. While most of the local cuisine refers to the whole of Alberta, there is one dish prominently known as originating in Edmonton – Green Onion Cakes. What are they? Originally a dish from Northern China, these were brought to Edmonton in 1979 by Siu To. Green Onion Cakes are fried flatbread with fine slides of green onion, served with sambal oelek. Local food items that are distinct of Alberta are Taber corn, bison, Alberta Beef and Puffed Wheat Squares. Additional local favorites that come from global influences are pierogis, Vietnamese subs and donairs. If you have any questions about inflight catering for private jets in Edmonton, Alberta, Canada; contact weborders@airculinaire.com.